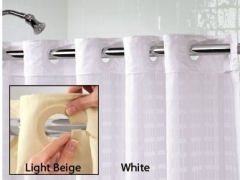 Aside from saving consumers money on the actual shower hooks (this eliminates the need for them), with the Hookless shower curtain there is no need to remove the shower rod in order to hang the shower curtain. Just take it off, wash it and pop it back on! We all dread the process of removing a shower curtain and rehanging it after washing it. So much so…that we just leave it there to get full of mildew (unhealthy for sure) Ultimately this leads to having to replace them unnecessarily rather than washing them and that is a waste of money. 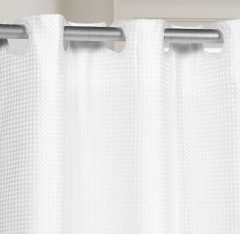 So the next time you are in the market for a new shower curtain, consider a Hookless Shower Curtain instead. 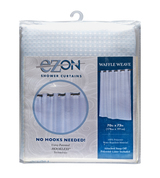 Do you buy hookless shower curtains for a hotel, gym, fitness center, spa, summer camp, college dorm or anywhere that uses shower curtain in bulk?